ONE of the strangest contraptions yet to make its appearance in the musical world was exhibited recently at the German Radio Show in Berlin. 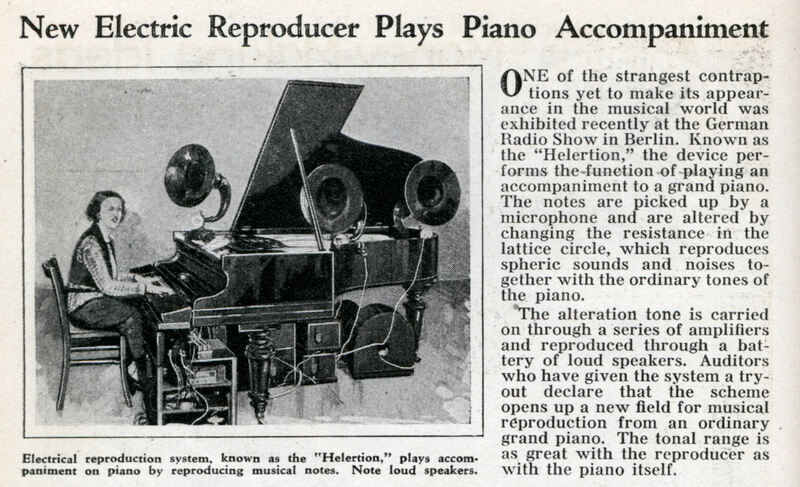 Known as the “Helertion,” the device performs the function of playing an accompaniment to a grand piano. The notes are picked up by a microphone and are altered by changing the resistance in the lattice circle, which reproduces spheric sounds and noises together with the ordinary tones of the piano. The alteration tone is carried on through a series of amplifiers and reproduced through a battery of loud speakers. Auditors who have given the system a try-out declare that the scheme opens up a new field for musical reproduction from an ordinary . grand piano. The tonal range is as great with the reproducer as with the piano itself. I’m not sure I would have noticed the loud speakers if the photo caption hadn’t mentioned them.